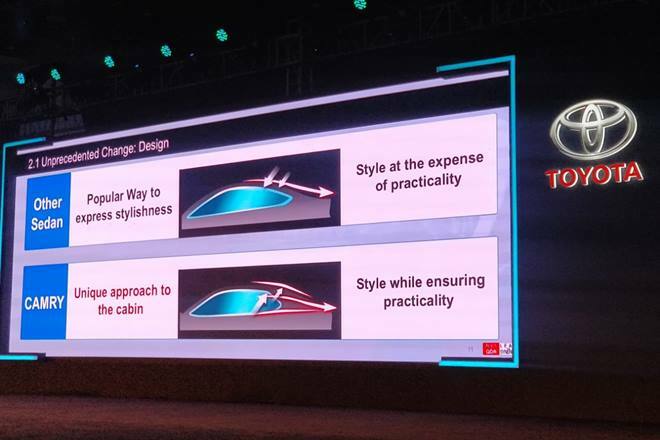 Toyota Camry India Launch Live Updates:: The new Camry has been officially launched in India with a fresh new design and 'Dynamic Force' 2.5L engine. Underpinned by Lexus ES300h platform, the new Camry is priced well under Rs 40 lakh. Toyota Camry 2019 Price in India Live Updates: Toyota has just launched the eight-generation Camry in India. The 2019 Toyota Camry boasts of a sharp new design with a massive Lexus-like grille up front and is based on TNGA platform that underpins the Lexus ES300h. 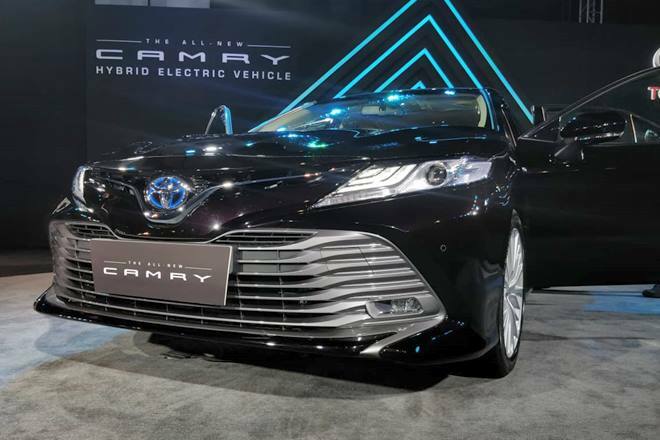 The Toyota badge on the nose gets blue accents which highlights the 2019 Toyota Camry's hybrid inclination. The engine is paired with the same e-CVT gearbox as the outgoing model. The new car's design swoops lower at the rear compared to the outgoing model, which Toyota says has not compromised cabin space. Toyota have said that the new car will also deliver better efficiency without having to compromise on driving dynamics. The new 2019 Toyota Camry will be powered by a new 2.5-litre 'Dynamic Force' engine. 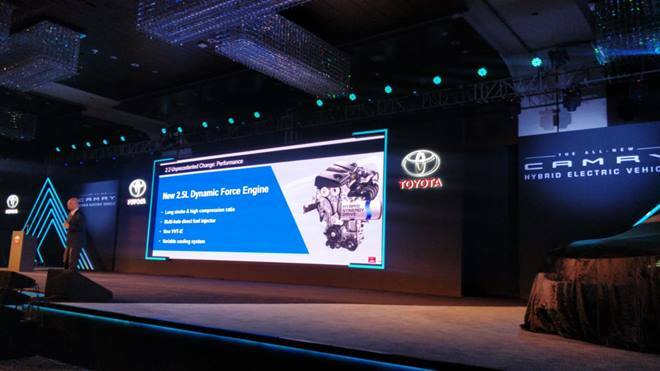 Toyota has said that the TNGA combustion happens at the centre of the cylinder which delivers better throttle response. The 2019 Camry will look very different compared to the previous generations with refurbished design and styling, that make it appear a lot sleeker than before. The new Camry is underpinned by Toyota New Global Architecture (GA-K) platform, that also serves as the base for the Lexus ES300h. Before we begin with the details, here's a teaser released recently by Toyota India. The new video featured the 2019 Camry badge with blue accents, which surely highlights its hybrid inclination. 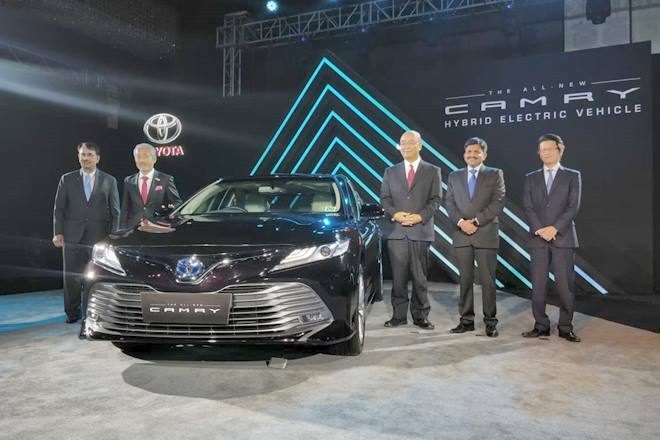 2019 Toyota Camry has been launched in India at an introductory price of Rs 36.95 lakh (ex-showroom). It comes powered by a 2.5-litre four-cylinder petrol hybrid engine that puts out 177 hp at 5,700 rpm and 221 Nm of torque. The sedan has been updated with a host of new features on the inside, such as a touchscreen control unit on the centre armrest at the rear passenger seat, tilt & slide moonroof, and a lot more. In terms of safety, the new Camry features nine airbags, ABS with EBD & Brake Distribution, switchable traction control, among others. It is available in four new colour options and on the inside, it gets Beige leather upholstery. In its segment, the new 2019 Camry competes with the likes of Honda Accord Hybrid and Volkswagen Passat. 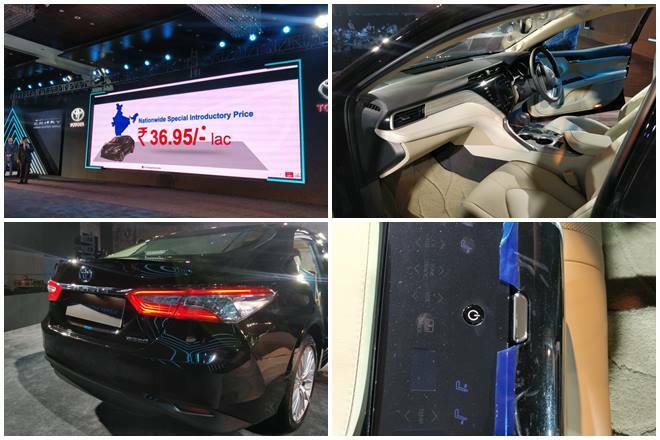 Read more here: 2019 Toyota Camry launched at Rs 36.95 lakh in India: Lexus DNA, updated motor and more! The new Toyota Camry is powered by a 2.5-litre four-cylinder petrol hybrid engine that puts out 177 hp at 5,700 rpm and 221 Nm of torque 3,600-5,200 rpm. The hybrid system motor generator delivers a power output of 119 hp and 204.1 Nm of torque. The steering wheel of the new Camry comes with controls for audio, MID, telephone control and cruise control. The cockpit also has a 10" HUD (head-up display). Besides these, the new Camry also get wireless smartphone charger (compatible phones), rain sensing wipers, electrochromic inside rearview mirror, rear window defogger with timer and front & rear door courtesy lamps. The new Camry cabin boasts of a tilt and slide moonroof and the rear passenger seats have power reclining function. The centre armrest on the rear seat gets a touchscreen control for audio, seat recline, rear sun shade, and three-zone automatic climate control. The new 2019 Toyota Camry comes with a JBL audio system with nine speakers, along with an onboard navigation service with personal assistance. It gets a touchscreen infotainment system with DVD, AM/FM, USD, Aux-In, and Bluetooth. The new Camry registered a 5-star safety rating from New Car Assessment Program for South East Asian Countries (ASEA NCAP). 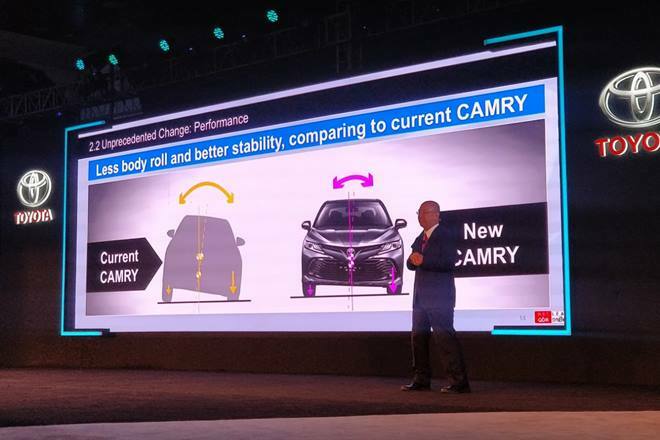 In terms of safety features, the 2019 Camry will be available with nine airbags, ABS with EBD & Brake Distribution, switchable traction control, impact sensing fuel cut, immobilizer, ISOFIX and a lot more. 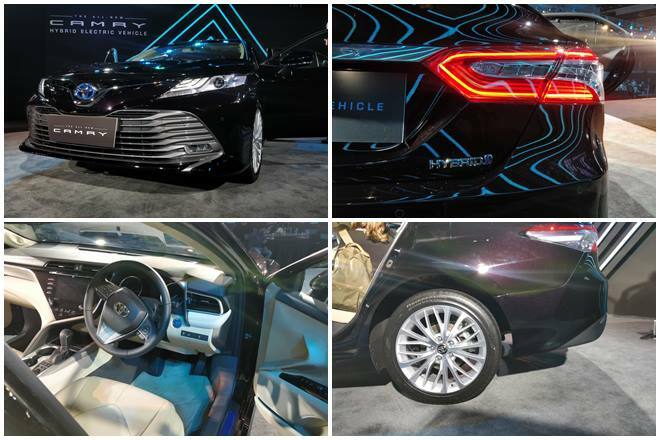 The new 2019 Toyota Camry Hybrid will be available in four new colour options - Platinum While Pearl, Graphite Metallic, Red Mica, and Burning Black. The new car's cabin has been given a Beige colour treatment. Masato Katsumata global chief engineer of the Camry said during the launch of the new car, the Camry is the most popular midsize sedan in the world. The new Camry has a smaller A/C and a thinner A-pillar, along with relocated mirrors which equates to more space inside the cabin. Besides, the new car has been lowered which promises better stability. The roof and bonnet of the new 2019 Toyota Camry have been lowered, but yet the cabin space has not been compromised. Despite the sloping C pillar, the new Camry does not comprise on space like other sedans. 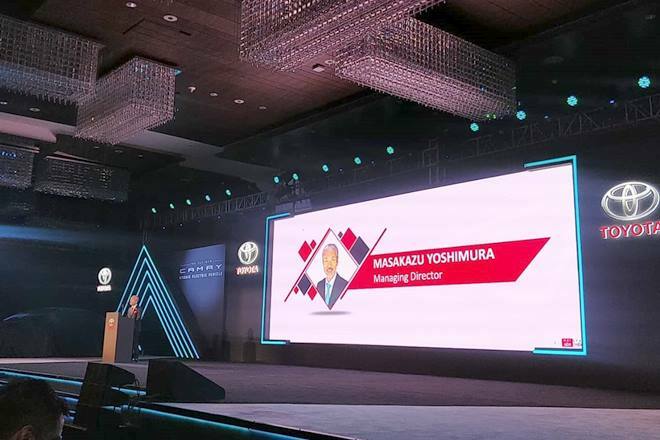 Masakazu Yohimura, Managing Director, Toyota takes the stage, talks about the fact that the climate is right in India for electric vehicles and hybrids. New Camry's launch is closing in! The stage is set and the wraps will be off the new 2019 Toyota Camry any time now. So, stay tuned and as we bring details live from Aerocity, Delhi! In an announcement made in July, Toyota Kirloskar added the Toyota Yaris to its 'Drive the Nation' campaign - a special sales initiative that caters to state and central government employees, and defence personnel. The campaign has had Toyota Innova Crysta, Etios range along with Toyota Corolla Altis. Expect the new features and factors like rising forex rates and price of commodities to add to the price of the new 2019 Toyota Camry. We expect the new Camry to launch around Rs 40 lakh mark which will keep it competitive with Honda Accord Hybrid's Rs 43 lakh price tag. The changes on the new Toyota Camry will continue in the inside as well with a design that separates the cockpit from the cabin. The international-spec model's interior is marked by a new 8.0-inch infotainment system based on what Toyota calls their ‘Human Machine Interface’. It is likely the new Camry's infotainment will support not Apple CarPlay or Android Auto. The new 2019 Toyota Camry sedan is 29 mm longer, 14 mm wider and has a 49 mm longer wheelbase as well compared to the old car. It sits 35mm lower than the outgoing model in the international markets, however, this could be which could be altered for the India-spec model. The base variant of the 2019 Camry will likely be powered by a 167 hp 2.0-litre paired with a six-speed automatic transmission. The others include a new 2.5-litre that makes 209 hp and is paired with a new eight-speed auto, a 2.5-litre hybrid, whose combined output has risen from 205 hp to 211 hp. The hybrid will use an electronic CVT gearbox. The India-spec model of the 2019 Toyota Camry will share most of the design cues with the Camry on sale in international markets. Toyota have completely refurbished the front fascia with LED projector headlamps and LED DRLs (daytime running lights). Toyota has retained the core design philosophy of the Camry, but it is now in line with the company's new Keen Look Design language giving it a sleeker appeal. The horizontal line now gets the added V-shape element under the grille, like the Lexus, the Toyota also get an extended grille on the lower bumper with louvres for air-intake. 2019 Toyota Camry Hybrid India Launch Live! 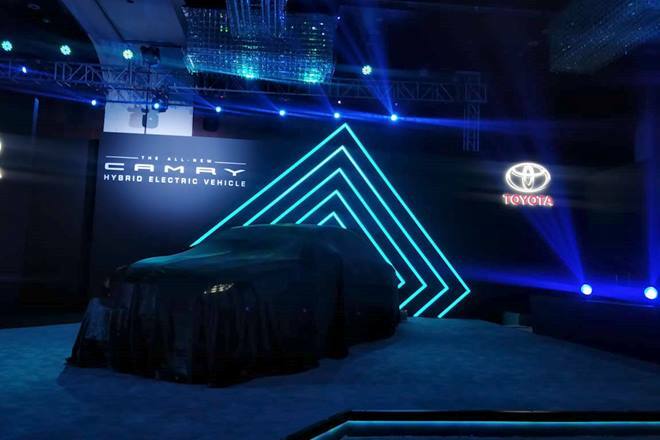 We are at the 2019 Toyota Camry Hybrid launch event in New Delhi today to bring you details live from the venue. Stay tuned for details on 2019 Camry's price, powertrain, variants, delivery and more. The manufacturer will be officially launching the new Camry in India soon. Toyota Camry hadn't had a revamp since a very long time in India. It was given a major update in 2015 with the introduction of the hybrid version. Toyota have launched now the new Camry at a price tag well below Rs 40 lakh mark.